Humble Pie’s Long Lost Vintage Album Joint Effort Finally Sees The Light Of Day! LOS ANGELES, CALIFORNIA - – In 1974, one of the biggest and best blues rock bands of all-time, the great Humble Pie, began recording an album at their own home-built studio called Clear Sounds. The result was a raw and fiery collection of originals and covers that was promptly and unceremoniously shelved by the band’s label, never to see the light of day...that is, until now! The previously recording will be released by Cleopatra Records on Feb. 8. The album was reportedly rejected by the band’s label at the time, A&M Records, and relegated to a vault. The lineup of the band on the release is guitarist/vocalist Steve Marriott, guitarist Dave Clempson, bassist Greg Ridley and drummer Jerry Shirley. 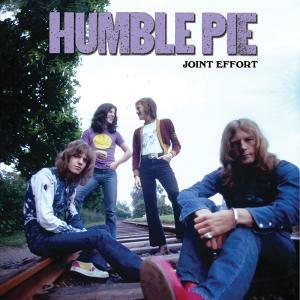 Joint Effort, a title given to the project early on that reflected the collaboration between Humble Pie founders Steve Marriott and Greg Ridley, is a reunion album of sorts in that Marriott had recently walked out of the group. But a near miss at taking Mick Taylor’s spot in The Rolling Stones plus renewed interest in the band Stateside coaxed Marriott back into the Pie alongside guitarist Dave Clempson and drummer Jerry Shirley.